As a partner with UW's Campus Sustainability Fund, we encourage everyone to take public transit to this year's Night Market! Take Link Light Rail to its northern terminus (University of Washington Station). Exit the station and cross the pedestrian bridge into campus. Head northwest along Rainier Vista (toward Drumheller Fountain) for about 0.4 miles to reach Red Square. ​We recommend parking at the free parking lots as shown in the map below. Click here for help locating available lots on campus. Alternative: Central Plaza Parking Garage - Paid parking is available for $10, but spaces are limited. ​Entry into the parking garage is at the intersection of NE 41st St and 15th Ave NE. The garage is equipped with motorcycle stalls and EV charging stations. Do not use the express lanes. Take Exit #169 (UW — NE 45th St. Exit). Go east (right turn from I-5 north, left turn from I-5 south) on NE 45th for about 0.5 miles. Turn right on 15th Ave. NE and continue for several blocks. Turn left at NE 41st (stoplight) to park in the Central Plaza Parking Garage. Take SR 520 (the floating bridge) westbound toward Seattle. Take the Montlake Blvd. NE exit. Turn right (north) onto Montlake Blvd. and cross the Montlake Bridge. 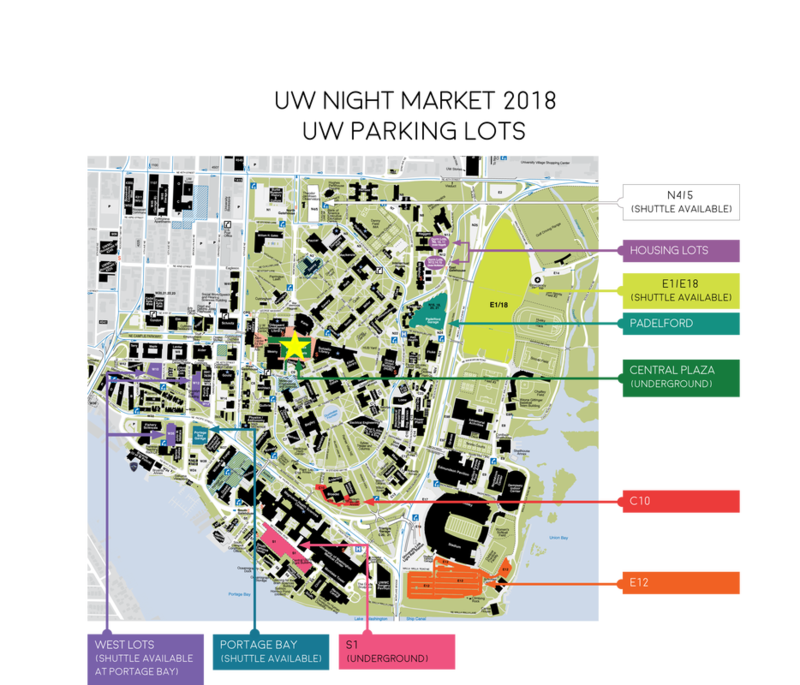 Just past the bridge, turn left on Pacific Ave. and continue west for several blocks past the UW Medical Center & Health Sciences complex on your left. Turn right at 15th Ave. NE and continue north about three blocks. Turn right at NE 41st (stoplight) to park in the Central Plaza Parking Garage. See you soon at Night Market!